Remember “Friday night is speedway night in Adelaide!”? 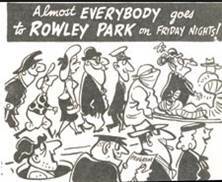 And the cartoon “Almost everybody goes to Rowley Park on Friday nights” which showed everyone from a grandmother to ambulance drivers and a jockey all making their way into the speedway. Ah yes, the golden era of speedway with Kym Bonython and his company Speedway Pty Ltd. In its heyday Rowley Park Speedway was attracting crowds every Friday night upwards of 15,000. In 1965 a reported crowd of 20,000 “Pie Eaters” (Kim Bonython’s nickname for the regular speedway crowd) packed into the speedway to see Australia’s first Demolition Derby. The police were called in to handle traffic and hundreds of fans were turned away as the ‘House Full’ signs went up. The derby itself had 100 entrants and lasted for over 75 minutes. Bonython himself wasn’t just the promoter and director of Rowley Park Speedway. He was also a speedcar driver who had considerable success winning the South Australian Championship on two occasions. He was also involved in some of the more spectacular crashes seen at the speedway though luckily he didn’t suffer any serious injuries at the wheel in an era when driver safety wasn’t a major concern and major injuries or even death was accepted as just part of the sport. Leighton Rutt recalled; “I went there on Fridays nights on many occasions, watching greats like Kim Bonython, Jack Scot (Scotty I think he was called) and many others such as the great Bob Tattersall, Bill Wigzell and Ray Skipper. Those were the days. Hence if you were near the fence I think the term ‘Here’s mud in your eye’ was conceived LOL”!! Eddie Barton also reminisced; “ The early days of Rowley Park were great entertainment. Nicknamed the “Pughole” because of it’s location and the texture of the surface that the cars, solo’s’, sidecars and the “old stockies” plus “TQ”s raced on. Those early day’s had great “entertainers” on the track who gave there all with the likes of Jack Young (solo) 99 Joe Blow Schubert, Old Smokey, Kym Bonython plus many Interstate and Overseas competitors who judge Rowley Park as one of the best tracks to race at in Australia at that time”! Rod Harrison wrote; “ We used to catch the train from Salisbury to get to Rowley Park. You could often collect enough empty deposit bottles to pay for your entry ticket plus the train ticket home” and Shaun Oxley commented; “Speedway was never he same after Rowley closed and moved to speedway park. At Rowley Park you were always so close to everything, I remember getting showered by stones and mud every time the cars sped around the bend”. For Carol Shannon it brought back vivid memories too; “I remember standing right by the fence when I was a kid and the clods of dirt would fly up from the track and you were smothered in wet clay. Your hair was full of lumps of it! I loved it and still love motor sport to this day. We used to go and watch “Jack Larritt” I think his son Jacky drove the car and the family were friends of Dads. Beautiful memories”. Rowley Park Speedway’s long-time Clerk of Course was Glen Dix, who would later become internationally famous as the man who waved the checkered flag at the Australian Grand Prix during its years in Adelaide from 1985 to 1995. Due to complaints from residents about noise and the on-street parking, as well as the track becoming too small for the faster cars appearing on the scene, the speedway was closed after the 23rd meeting of the 1978/79 season. I often pass the housing estate where Rowley Park used to be, on Torrens Road, Brompton (on my way to the football) and I’m immediately taken back to those summer nights with the huge crowds, the smell of the petrol fumes, the cars flying around the track, the noise and the sheer excitement of Rowley Park Speedway. Any memories you would like to share? The speedway was a pughole; brickyards and clay pipe makers sourced clay from that site creating a massive hole in the ground. The intention of the owner before it became a speedway was to make it a soccer stadium, but getting grass to grow was a problem they couldn’t overcome. My dad lay down the original cinders track and later dolomite track. Went to Rowley Park from 1958 to it’s closure in 1979. Hardly missed a meeting. Still have a lot of old programs. It was the place to be on friday nights !! Sometimes I wish I could go to just One More Meeting. The ironic thing about Rowley Park being too small for the faster cars (i.e. Sprintcars), the track was 358 metres long. They currently race Sprintcars at Murray Bridge which is only 2 metres longer than Rowley Park was and today’s Sprinters are faster than those which raced in 1979. Unfortunately it was more its location that killed it than anything else. Speedway Park/City is a good facility and I practically grew up there on Friday nights during the 1980’s, but unfortunately if you live in the southern suburbs like I currently do it costs just as much to get there and home by car as it does to get into the place because its the only way to get there as its not serviced by public transport. At a guess I’d say that at least 80% of the regular Speedway City crowd is made up of those living north of the city. I know a number of people who live down south who don’t attend simply because of the costs and travel time, which is a shame. I was 6 weeks old for my first visit to Rowley Park, and every Friday night we would go…how i miss those Fumes, Atmosphere, Bikes and Cars, the Mud the crowd, glory days!! We would stand at the fence with our full face motorcross goggles on watching the solo’s and dodging the mud! Aah but no gas off,very exilarating,like the duck for cover because we were clean with a girl. ..some of the cars use turn up in bits at work for a while,but they closed Rowley for speedway park to be used instead..up nth near A.I.R./drags..I wonder if the Christmas tree still gets used…at air that is. Loved the Speedway at Rowley Park. First went with my Dad in about 1954 at 7 years of age. I remember Bob Leverenz was the best solo rider at that time and was handicapped at around 250 yards and Merv Harding at 210. Who remembers “Shorty Schirmer” also a solo rider and big Don Willison on the ‘Outfits’ and his bright red face? In the 60’s I remember having a Chiko Roll for dinner every Friday night at the Speedway and we always sat on Dunlop Corner. I have a number of photos and clippings from those days and I remember that we lived 2 houses away from Arny Sunstrom. He used to tear up and down Torinda Ave, Croydon, which was dirt in those days, when tuning up ready for the Friday night’s meeting. Sadly he died in 1959 as the result of an horrific crash. I consider myself so lucky to have been part of the ‘heart stopping’ action every Friday night and especially when the sidecars came out and you knew there would always be a prang during the race…great memories. Anyway, my sister-in-law now lives in the housing estate that went up when Rowley Park Speedway closed! My dad and i used to go to Rowley park for the solos. We’re from England and watched the British lions race against Australia. Johnny Boulger was my favorite Aussie rider. Speedway just isn’t the same. first went to rowley park in the early sixties and loved the whole atmosphere.Ron Wood moved down the end of our street and talked to him quite a bit about his life as a driver.Eventually ended up buying his FB ute called Lady Luck ,a push car and later the fire tender at the [pughole].Speedway hasn,t been the same simce the sixties.Wish I could turn back the clock to those friday nights again!